The Honourable Lawrence Cannon, Minister of Transport, Infrastructure and Communities, along with the Honourable Jim Flaherty, Minister of Finance, today announced a new funding package for VIA Rail Canada Inc., a Crown corporation, to revitalize inter-city passenger rail services in Canada. The funding totals $691.9 million over the next five years. "Today, Canada's New Government is acting to provide faster, cleaner, more frequent and reliable passenger rail service across Canada," said Minister Cannon. "The corridor between Quebec City and Windsor has the largest passenger volumes and will benefit from infrastructure improvements that will make the entire passenger rail system more efficient and accessible." The equipment refurbishment will also help improve the company's environmental performance through increased fuel efficiency and reduced greenhouse gas emissions per passenger. Now, let's see if some of that cash makes it all the way down the 401. Posted by Chris Holt at 9:39 a.m. It is a shame that when Paul Martin Jr. came in that he canceled Chretien's motion to bring high speed rail to the Windsor-Quebec corridor. 2 hours to Toronto would make it much more appealing to take the train instead of hopping into a car and onto the 401. 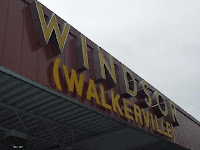 "It may cost more to ride the bus in Windsor. Transit Windsor administration is looking at ways to reduce spending in next year's budget without affecting service. Transit Board Chair, Caroline Postma, says that may mean a fare increase but administration is exploring other options as well." How do ridiculously high transit fares encourage public transit? Same goes for Via Rail. Reducing prices could actually help increase ridership. October 13, 2007 at 2:04 a.m.
Until rail is both high speed and affordale, it will continue to remain a joke. Take a look a the French System, when In France I can take a TGV from Paris to Lyon a distance of 466 km by car for less than VIA costs to Toronto, and it will get me there in a little over 2 hours. VIA needs a total overhaul. This money is just like putting a suit on a pig. October 14, 2007 at 4:36 p.m.